BUJUMBURA December 3rd (ABP) – The Ambassador of the Russian Federation in Burundi, Mr. Giorgy Todua, awarded a national decoration medal on Friday to the 2nd deputy President of the Republic of Burundi, Dr. Joseph Butore as a marker of “friendship” given to him by the President of the Russian Federation, Mr. Vladimir Putin. Dr. Butore expressed his thanks to President Putin for that decoration, while also outlining his contribution to the development of relations of friendship and cooperation between the two countries. Ms. Kabushemeye said that the Russian Federation has continued to show support for the people of Burundi, both in good times and the most difficult ones and that this support goes straight to the heart of the Burundian people. Cooperation between the two countries is highly appreciated, according to Kabushemeye. In addition to the cooperation agreements that were signed several years ago, other cooperation agreements have been signed in recent years. These include the partnership agreement between the Bank of the Republic of Burundi (BRB) and a Russian bank “Gazprom Bank” signed in Moscow on June 21, 2016, the collaboration agreement between the Federal Chamber of Trade and Industry of Burundi (CFCIB) and the Trade Chamber of the Moscow Region signed in March 2017, the cooperation agreement between the Ministry of the Interior of the Russian Federation and the Ministry of Security of the Republic of Burundi, signed on May 24, 2017, the international cooperation agreement between the University of Burundi and the Academy of Veterinary Medicine of Kazan signed during the visit of the 2nd deputy President of the Republic of Burundi in Kazan from 3 to 4 June 2017, the agreement between REGIDESO and the corresponding Mordovian company signed in 2017, the agreement on the mutual abolition of visa procedures for holders of diplomatic or service passports signed in Bujumbura on February 6, 2018, the memorandum of agreement on cooperation in higher education signed on April 18, 2018 and the Russian-Burundian intergovernmental agreement on military cooperation signed in Moscow on August 23, 2018, at the end of the international military-technical forum in May 2018.Ambassador Epiphanie Kabushemeye-Ntamwana, interim Assistant of Burundian Minister of Foreign Affairs, said that the Government of Burundi highly appreciates Russian cooperation and expressed the strongest wish to strengthen that dynamic between the two countries. 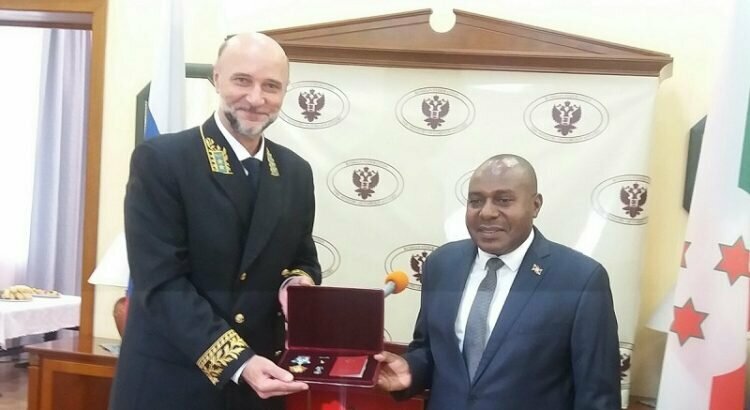 She affirmed the determination of the Government of Burundi to spare no effort to that end, recalling that on the occasion of the celebration of the 56th anniversary of the independence of Burundi, Burundian President Pierre Nkurunziza decorated the ambassador of the Russian Federation in Burundi. Those decorations are very significant gestures that testify the good quality of the relations between the two countries. 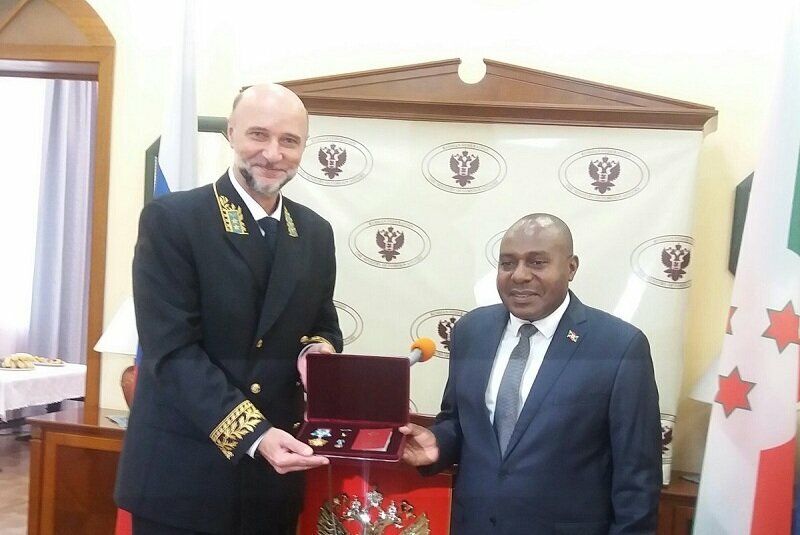 That decoration to Dr. Butore testifies the recognition of his work and his commitment to strengthening relations between Burundi and Russia. The Russian Federation also intervenes in the education sector by granting scholarships to higher education to Burundian students and executives. During the 2017-2018 academic year, 40 scholarships for higher education were offered to Burundi in the fields of specialization, compared to about 20 scholarships granted per year in previous years. The training of the Burundian military and several teams of Burundian peacekeepers also receive training from the Russian Interior Ministry, without forgetting to mention the presence of Tanganyika LISMA (TTLINNO) investors in Burundi, who manufacture light bulbs and the visits of the higher authorities in both countries. The Ambassador of the Russian Federation in Burundi, Mr. Giorgy Todua, in his speech, emphasized the respect for the sovereignty of the Republic of Burundi. “We observe what is happening in Burundi. I do not agree with the assessment that there is a crisis in Burundi. There is no crisis in Burundi. The situation is normal. Burundi poses no threat to international security or regional security”, said Ambassador Todua, adding that the revision of the Constitution and the composition of the Independent National Electoral Commission (CENI) are a matter of Burundians’ concern and that Russia respects the decisions of Burundi that it will accompany. He felt that what is already done by the Russian Federation represents almost nothing and that much more needs to be done, going beyond 40 scholarships per year and 20 military and police officers who benefit from training on the spot or in Russia. He also promised a lot of cooperation projects between reciprocal chambers of Trade, more efficiency for Tanganyika LISMA (TTLINNO) and more investors in the field of minerals.